These flexible cameras have multiple sensors that can be moved and rotated to provide the optimal field of view for a wide range of circumstances. 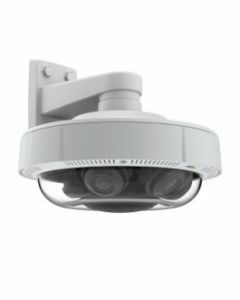 They deliver up to 360° coverage, or a combination of overview and detailed coverage in a single-camera installation with a single software license. The result is a unique combination of great coverage, and greatly reduced costs for software, installation and cabling. AXIS P37 Series cameras are perfect for large indoor and outdoor areas like stores, shopping malls, warehouses, parking lots and lobbies. They’re also ideal at hallway, aisle and road intersections and at the outer corners of buildings.